Each year, the traditional Zapotec village of San Juan Guelavia showcases its handmade baskets made from strips of river reed, called carrizo in Spanish. (Thanks, Christopher Hodge for this tidbit of clarification. Carrizo is not bamboo!) This is another artisanal weaving tradition in the Tlacolula valley. 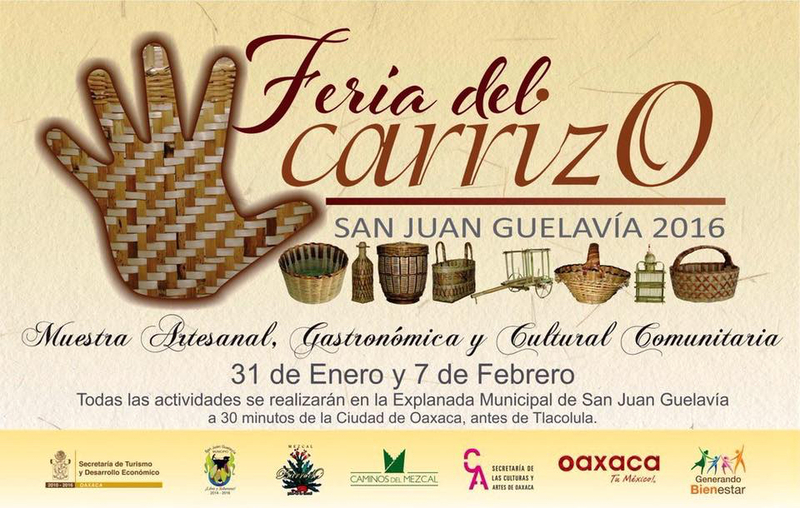 If you are on your way to the Tlacolula market this Sunday, making a stop off the Pan-American Highway-MEX 190 is well-worth your time to explore the 5th Annual Basket Fair or Feria del Carrizo. You might even want to stay awhile. The food is delicious. This is homemade, home-cooked food done with local flair. Barbecue, quesadillas, roasted chicken, tortillas made on the comal griddle, atole and mezcal tasting makes this a very special event. There are even mezcal bottles (empty) covered in basketry. And, you’ll drive along a beautiful curving road lined with maturing agave fields to get there. The handmade baskets take center stage. They come in all shapes and sizes. Some are plain, coarse and used as storage containers. Others are finely woven and decorated with mini-baskets, which the local Zapotec ladies love for gathering fresh food at the daily markets. Last year there were bamboo fish traps, lamp bases, bird cages, floor mats, and also very pretty flowers made from corn husks. I love these baskets to use around the house for storage and to give as house gifts filled with fresh fruit. The handles are wrapped in palm leaves. This basket making from San Juan Guelavia is a long-standing tradition. Help preserve it. The way of the world is giving over to plastic and we have a chance to make a difference and buy directly from the makers — usually the generation of grandfathers and grandmothers who are trying to keep the tradition alive. But to do that, we know that there has to be customers! San Juan Guelavia is just before you get to Teotitlan del Valle on the right (west) side of the Carretera Nacional as you are heading toward Tlacolula from Oaxaca city. Enjoy. Maybe I’ll see you there! This entry was posted in Cultural Commentary, Photography, Textiles, Tapestries & Weaving, Travel & Tourism and tagged bamboo, baskets, carrizo, celebrations, fair, feria, fiber, hand woven, Mexico, Oaxaca, San Juan Guelavia, weaving. Bookmark the permalink.